I don’t often write explicitly about the things I paint or draw. I am much more comfortable telling stories or creating word pictures than I am writing about a specific composition, why I did it, how I arrived at it, etc. Paintings are statements, after all, stories without a text, a succinct emotional statement that doesn’t depend on words; a glance, a gesture, a composition that requires a response. I don’t know that I have a specific approach to creating a painting. I will do anything from highly abstracted compositions to what some would call realistic art, although I will never compromise effect for being correctly realistic. This series of 4 compositions started out as “meeting notes”. Meetings invariably tax my attention span when what is being said could be said much more directly without the vast amount of equivocation and discussion of unimportant nuance. Like listening to a long winded salesman or dentist, all I want to say is “Cut to the chase. 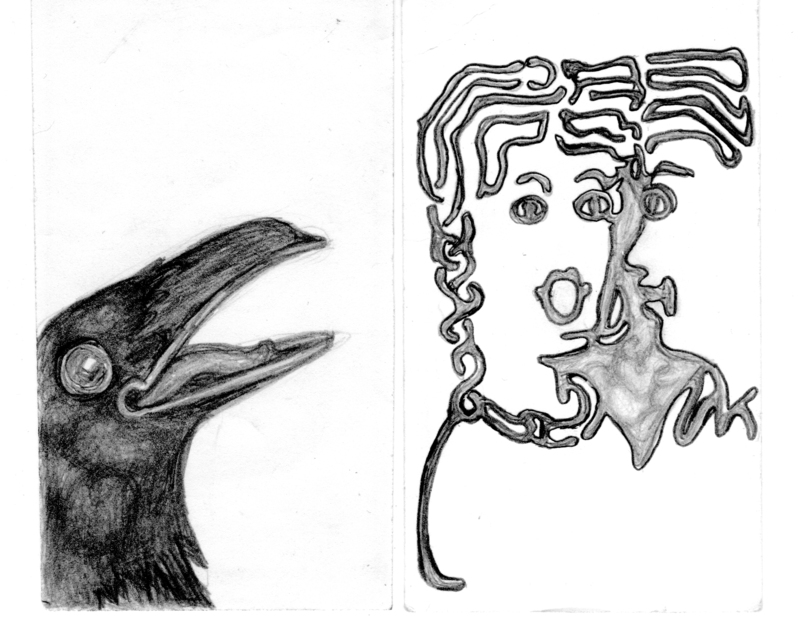 How much and what are my options?” Business cards are a good size for small, discreet drawings. 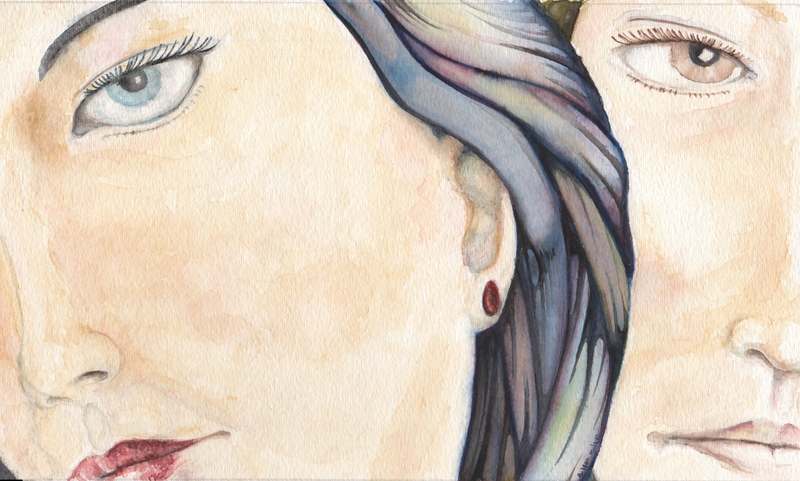 Many of my more fun paintings start out on the back of business cards, or a blank corner of a program. It’s also less disruptive than playing the harmonica, which is frowned on in meetings. As long as I find myself in a situation that requires a meeting, an appointment, a sermon, a speech, this series will never be done. Actually, she’s not a space alien. She arrived in this world the usual way. Quite smart too. Visualizing ancient Egyptian profiles where the eye is always from a frontal position is what pointed me in the direction of the two face motif. Add to that the notion that one could add a face behind the profile, making two faces that could also work as one from a frontal view. The meeting that led to this composition was, I believe, a circuit design and layout meeting for some forgotten electronic application, which I am certain is completely obsolete now. 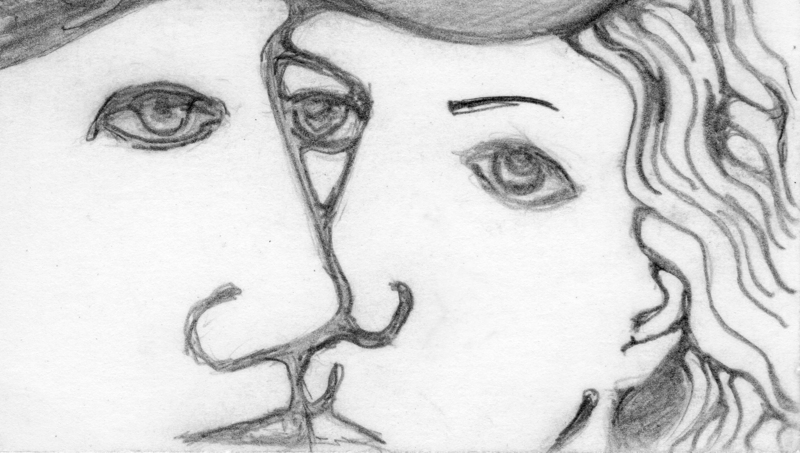 The business card sketch for the 2nd two faces. 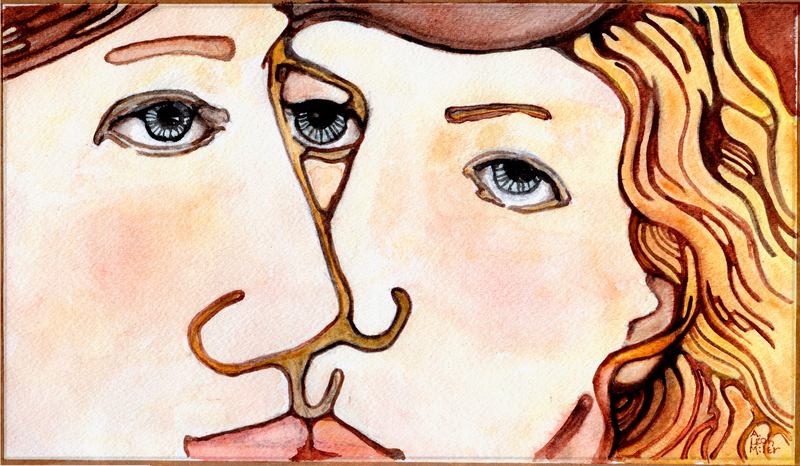 The 2nd two faces, is more illustrative of a meeting: A talker and a listener. 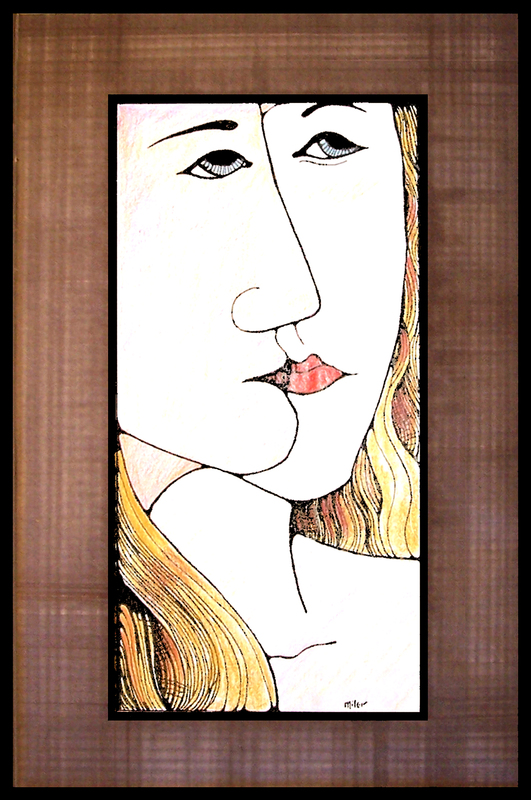 The challenge being to unite the two faces by joining the negative space between them in a common outline. The result is a bit of fun. 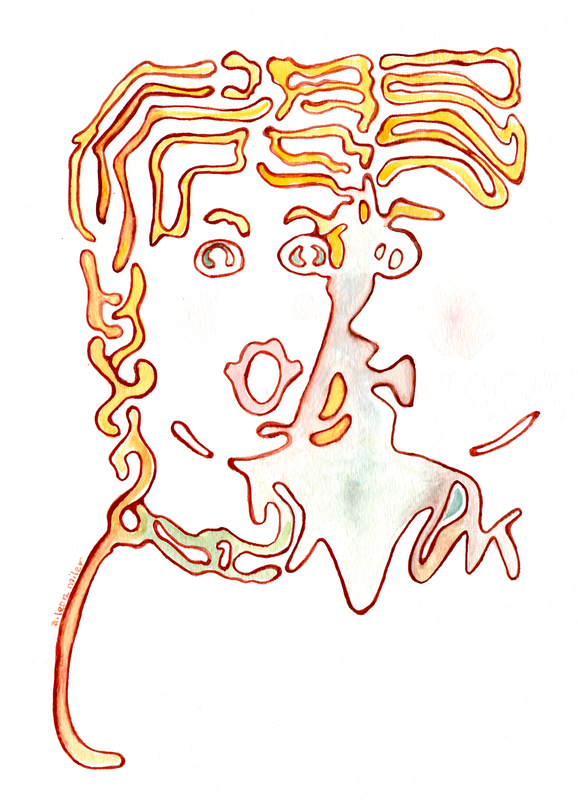 I don’t know whether he’s listening, but she’s talking, and I’m drawing. The raven is just there for the ride. It ended up in another composition. 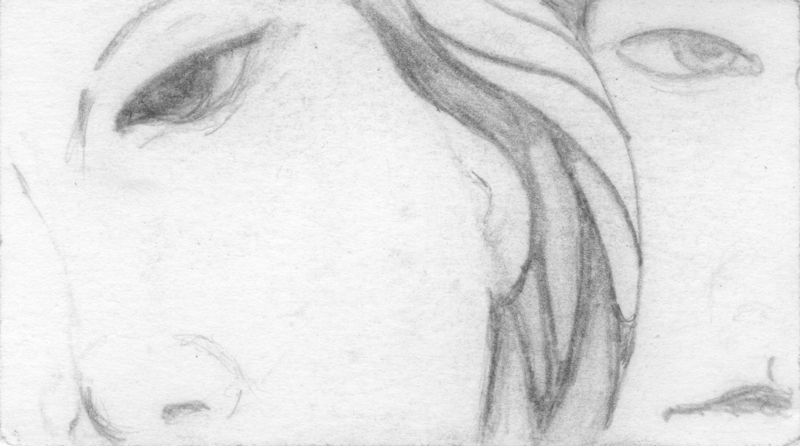 Business card sketch for the 3rd 2 faces. The 3rd two faces have the faces sharing an eye and a mouth if the one face is visualized as not in profile. Business card drawing for the 4th two faces. The 4th two faces turned into a Gothic romance. I tried to stay with the formula of blending the faces together, but they would have none of it. I am not sure what he said, or she said. I could have done something really cheesy like putting a tear in her eye, but that would never do. She might have a hint of a smile, but maybe not. You will have be the judge and write the dialogue. ← We were young and not to be denied…. I remember you, Barb. I am a bit at a loss as what to say from across that expanse of time, since it will not all fit neatly into a sentence, so we’ll try this: God is good, and has given us an extremely interesting journey. We’ll let it unfold from there. Thank you for your kind comments. This series of blogs is my effort to put my art out there without saying “I, me, mine” too much, so I try to entertain, amuse, perplex, etc.